When a lesson is flowing and your students are excited, you want to be on the move. With a MimioPad￿￿wireless tablet, you can control your whiteboard from anywhere in your classroom. It comes with a wireless USB receiver that communicates automatically with the MimioTeach system. That means the simple MimioStudio toolbars and menus are the same for both products. Walk anywhere you like, up to 9 metres (30 feet) away. 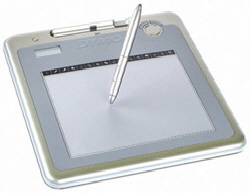 Write, point and click on the tablet with the MimioPad stylus. With a MimioPad tablet, you can pay special attention to individual students without giving up control of the lesson. Because you￿re free to move around, you can pay special attention to individual students and manage your classroom more effectively. And multiple tablets can be connected to one computer. Students love to take turns using a MimioPad tablet and click on the whiteboard without leaving their seats. Additionally, the system enables students with limited mobility to participate without going to the whiteboard.